Once your 14 day free trial has expired, you need to upgrade your account in order to access the full version of Jelastic. The full version of Jelastic includes extra features which aren’t available in the trial such as the ability to add public IP addresses to your servers and configure your own custom SSL certificates. 1. Login to the Jelastic Dashboard and click the ‘Upgrade trial account’ button to get started. 2. 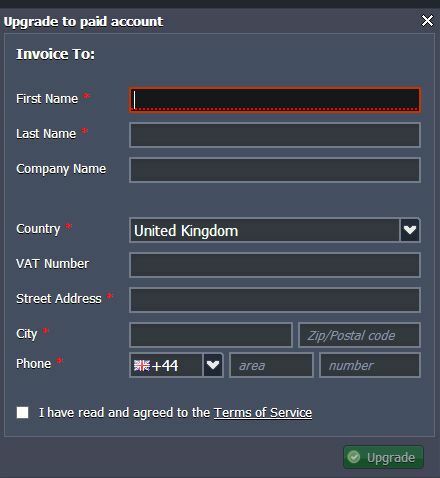 Complete your invoice details, items marked with a * are mandatory and click ‘Create Account’. 3. 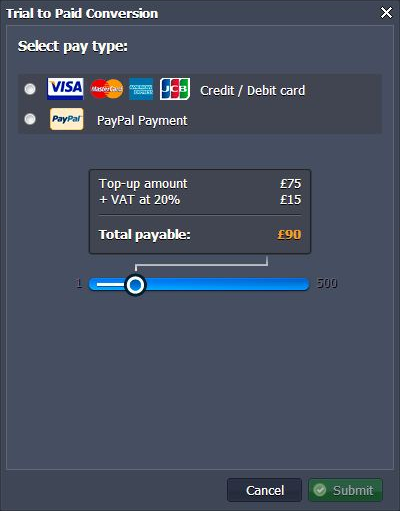 Select how much to deposit into your account as the initial account balance by moving the slider left or right, then press ‘Submit’. 4. Finally, complete your payment details. That’s it, the payment will appear in your account balance within a few moments!